DCL now offers a simple , all inclusive pricing that captures what has been our best seller over the last 8 years. Logo / Branded Border Design or Name of Event etc. 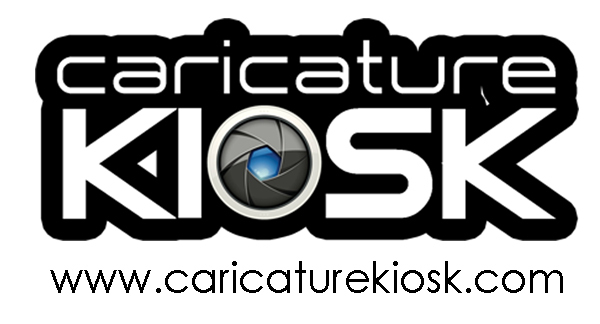 Digital Caricatures Live pricing is based on a per hour rate. 3 hour minimum per event. Call for custom quote! How can I book a Digital Caricatures Live Artist? Call 800-610-6341 or submit a request for quote on our Contact Page. DCL will provide a quote within minutes during business hours. A deposit is required for all bookings. What do the artists need to set up? Climate controlled environment with covering is preferred, outlets, and chairs...We got the rest! How far will you travel? We can travel anywhere, however, travel fees do apply for air and hotel etc. Call for a custom quote. How long does it take to set up? DCL typically allows 1 hour for setup at local events. How can we protect the images after printing? DCL will provide form fitting 2mm transparent bags for every print. *Lanyards and plastic holders can be purchased for all 4 x 6 prints. Matting is also available for 8 x10 and larger prints. I need more that one artist?! No problem, we have 6 artists available in Florida and 15 artists around the US/ Europe/ Asia! Is there a guarantee? Yes, DCL guarantees all events upon signing of contract and submission of deposit. In the event of an "Act of God", or other unfortunate event, DCL will find a reasonable and suitable replacement to perform. This often depends on the flow of traffic and abundance of people. Every Event is different. We do our best to keep up and can adjust level of detail etc depending on demand. If your goal is volume, let us know. However, most of our events are of the high-end nature so quality is preferred over numbers.